The cow is now the most important politico-religious icon in India. 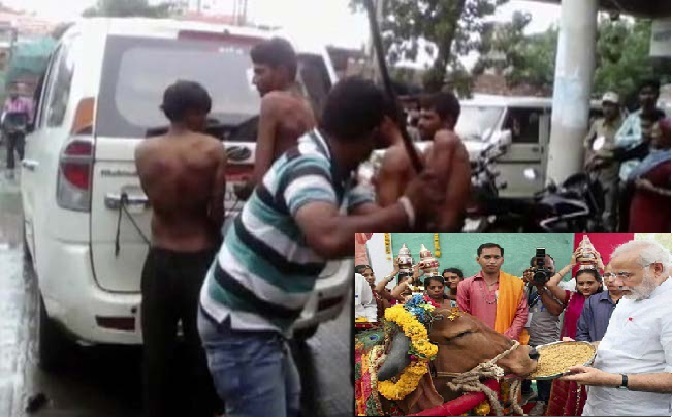 The self-proclaimed custodians of Hinduism and their political representatives in power are desperate to impose ban on cow-slaughter and beef-eating. As a result, there have been incidents of violence not only in a relatively unknown town like Dadri but also on the floors of State Assembly. More-over, efforts are on to raise it to the status of national animal. For the right-wing Hindu nationalists, the cow is the new fulcrum of communal agenda (as it was Ram Janmabhoomi in the 1990s). Of course, the fracas surrounding the cow has been in existence for ages. The Hindu traditionalists have considered the cow 'holy' and beef-eating a 'sin'. On the other hand, attempts have also been made to prove, on the basis of scriptural evidences, that the animal was, after all, not always sacred and beef-eating had been a regular habit among the Hindus in the past. Even men like Rammohun Roy and Swami Vivekananda came forward to argue that beef-eating and Hinduism were not always incompatible. But the issue continued to plague Hindu India as, since the nineteenth century onwards, beef-eating became a serious bone of contention between the liberals and the conservatives. Modern scholars, however, have approached the problem in another way. They not only confined themselves to cite a plethora of literary and historical data to uncover the past but also provide logical explanations as to why the practice of beef-eating, after a certain time, became unacceptable to the Hindus. But despite such efforts not much seems to have changed as regards the issue of the 'holy cow'. The principal reason for this is, of course, a vested interest that seeks to help a few remain socially and politically powerful. In fact, it is this politics of 'identity' that has been at work since the time when the Brahmins discouraged eating beef. It is also known as communalism. The early Aryans who came to India were semi-nomadic people with a dominantly pastoral economy. Cattle were the chief form of wealth for which they even fought inter-tribal wars. It is, therefore, natural that cattle (the most valued possession) would be sacrificed to propitiate supernatural powers. The Rigveda abounds in references to the flesh of animals (including the cow) being offered to various gods. This continued even during later Vedic centuries. Not only that, killing of the cow and eating its flesh on occasions like birth, upanayana (initiation ceremony), marriage, sraddha (rites for the ancestors) and entertaining guests (Panini uses the term yoghna for a guest) were quite regular in ancient times. The much-respected priests and sages (most notably Yajnavalkya) were also fond of beef. The Brahmanical lawgivers like Manu, Brihaspati and Parashara found killing of the cow and beef-eating a minor sin at the most, not major (upapataka, not mahapataka). Besides, the medical treatises of Caraka (first-second century) and Susruta (third-fourth century) unequivocally prescribe the flesh of the cow and other animals to cure various ailments. Epics like the Mahabharata and the Ramayana too bear testimony to the fact that eating beef was widespread among the Brahmins. Dietary preferences of the later Vedic people, however, gradually changed with time. The growing importance of agriculture (agrarian economy gained predominance with the diffusion of iron technology in particular) necessitated protection of cattle. Therefore, recommendations against animal sacrifice were laid down in the later scriptures. Further, the new social order that thrived on the varna system created a class-divided society from which the Brahmins and the kshatriyas benefited at the cost of the vaisyas and the shudras. Again, deforestation and the subjugation of the indigenous tribes formed the basis of the early kingdoms. It is natural that opposition to such a system would become inevitable. Jainism and Buddhism advocated an ideology which looked back to the days of tribal collectives when equality prevailed among the brethren and private property was non-existent. Therefore, the thrust on asceticism and non-injury (ahimsa) of all kinds. The new economic reality (plough agriculture and animal husbandry) which created surplus like never before and the growing popularity of an ideology that threatened the yajna-centric Vedic religion forced the Brahmins to think about a new strategy. In order to establish supremacy over Buddhism which had achieved state recognition by the time and regain their lost power and prestige both in royal court and among the masses, the Brahmins initiated image worship and building temples as an answer to building stupas and setting up images of the Buddha. Moreover, to score yet another point over Buddhism, Brahmanism began to discourage the yajna as a form of worship and the sacrifice of the cow and promote vegetarianism. Advocating the sacredness of the cow and its products (pancagavya) was also a part of this stratagem. But the truth is that in spite of the Brahmanical ruling on the pardonable offense of cow-killing and beef-eating such practices continued till about the twelfth century. Buddhism, being more practical than Jainism, accommodated dietary practices of the regions to which it spread. The so-called Untouchables (Dalits) among the Hindus too carried on eating flesh of the dead cow (they were the worst victims of the class-divided Hindu society). However, the need to establish 'Hindu identity' became all the more important with the advent and spread of Islam since the medieval times. But it was particularly during the British period that it consolidated as a socio-political force. Many Brahmanical dictums were re-introduced as a part of the Hindu revivalist programme. This, at the same time, created a sharp division among the conservatives and the liberals. Brought up on the foundations of Western liberalism and guided by rationalism, it was first the intelligentsia of Bengal who revolted against such senselessness that came to pass for Hinduism. The initial reaction of adopting Christianity gradually gave way to an approach towards social and religious reforms which later culminated into secular nationalist ideology. Of course, Hindu elements were initially exploited to rouse and spread nationalist ideology which somehow alienated the Muslims who, as a result, played into the hands of the British imperialists who were eager to divide and rule. It was indeed difficult for many patriots to anticipate, in the face of the need of the hour, the future course of Indian politics. The divisive forces of communal politics (both Hindu and Muslim) would remain a permanent bane of India, even after the Partition. But why would there be any need to re-assert 'Hindu identity' now? What purpose would it serve to the ruling party and its stooges? It is a fact that they have secured power through a mathematical miracle by getting a little more than thirty percent of the total votes cast. For the Hindutva forces to stay secured in power and to bring the rest of the Hindu population under its sway they have no option but to unabashedly play the communal card. And thanks to the ignorance of the Indian masses, the cow is certainly the icon they are clinging on to for smooth sailing. The Bharatiya Janata Party (BJP) [or its earlier avatar Jan Sangh] had always banked on the communal ideology. And the post-1992 success has certainly strengthened their belief. The point is: shall these Hindutva people be given a free rein to make India a Hindu rashtra by radically altering the essence of the Constitution? Will the progressive forces that have fought for long against obscurantism and bigotry to help make India a unique country whose basis is plurality be cowed into silence? But, every fascist epoch had to end. The history has always favoured the progressives. Sharma, R S, Material Culture and Social Formations in Ancient India (in Bangla). Trans. Gautam Niyogi. Hyderabad: Orient Longman, 1998. This essay was first published in Frontier [Vol. 48, No. 21, Nov 29 - Dec 5, 2015] and is reproduced here with the permission of the author.